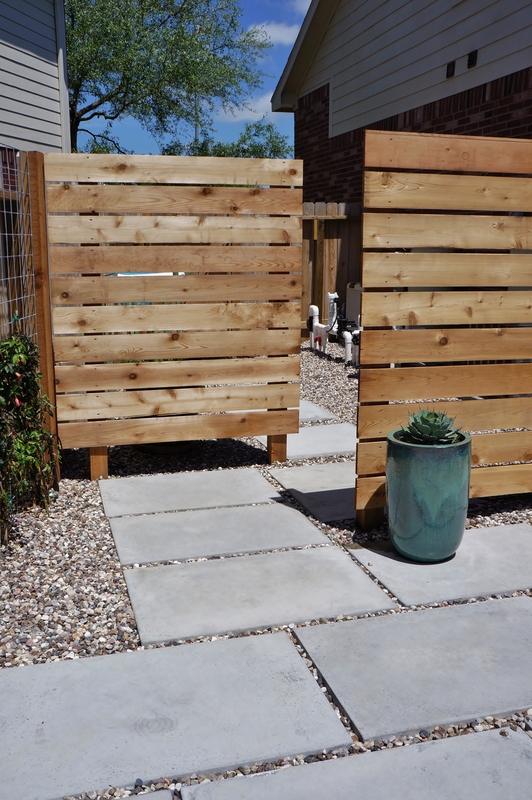 Designing Landscaping with my Daughter – A Great Experience! Just a few weeks back we finished a landscaping project, for my daughter Amber and her family, around the pool they had installed late winter 2015. 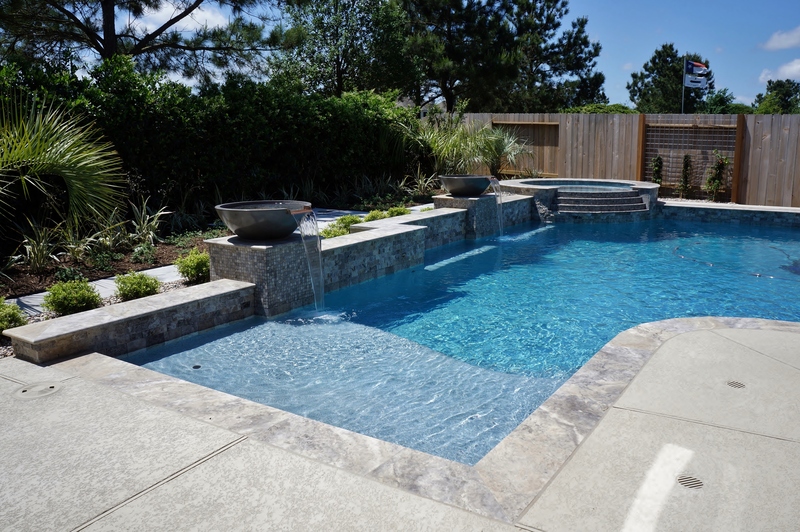 They had strong ideas of what they wanted and talked to several pool companies before going with Cypress Custom Pools. 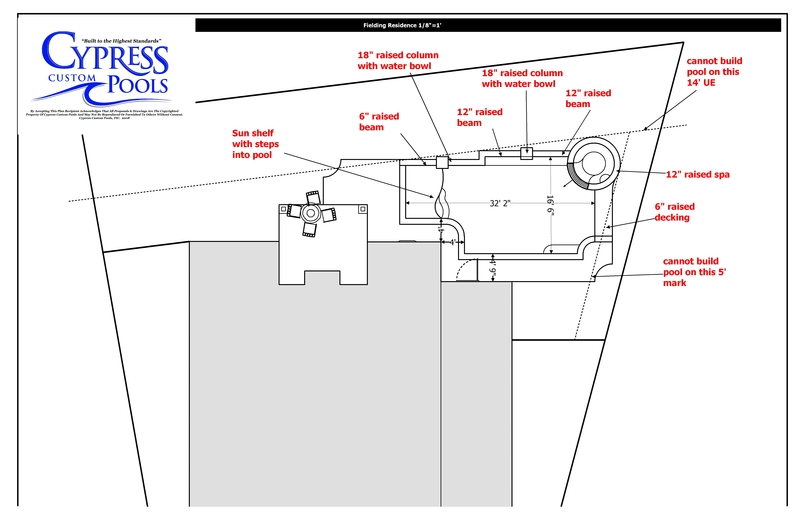 This is a pool that had to fit carefully into the space between the house and the utility easement to the south as well as staying off the property line to the west. We kept up with the pool install via pictures messaged to us by my daughter. They are very pleased with how the pool turned out. 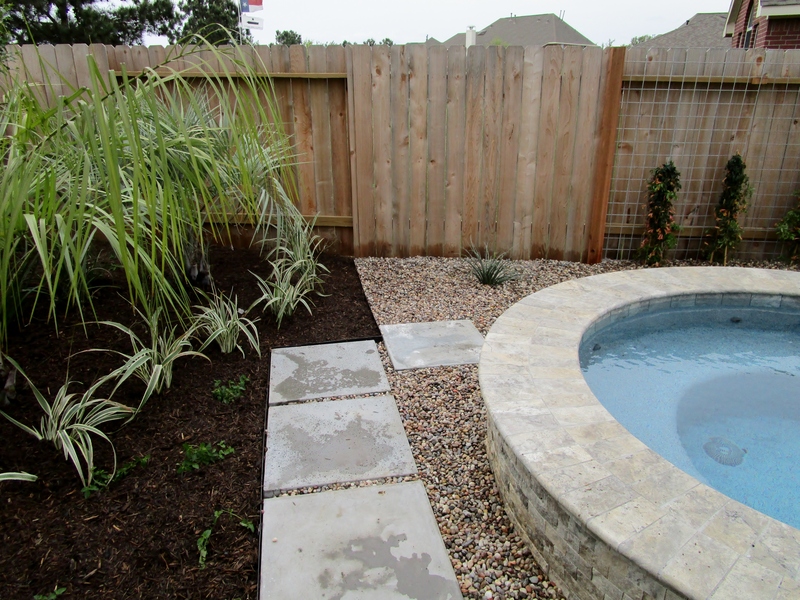 We worked on a landscape design that would work with all the materials they used in the pool. 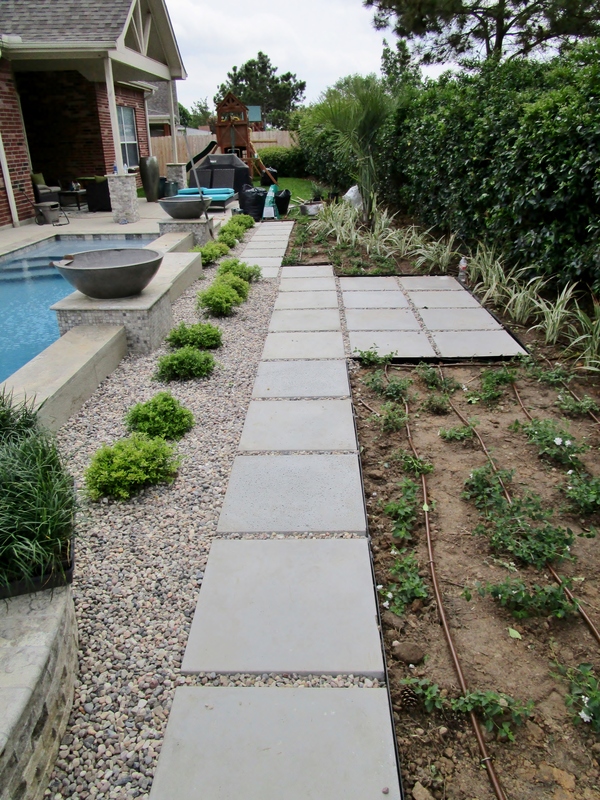 We wanted the hardscape and plantings to be a complement to the pool which is the real jewel and focus. Our part, the landscaping, is the background and frame. 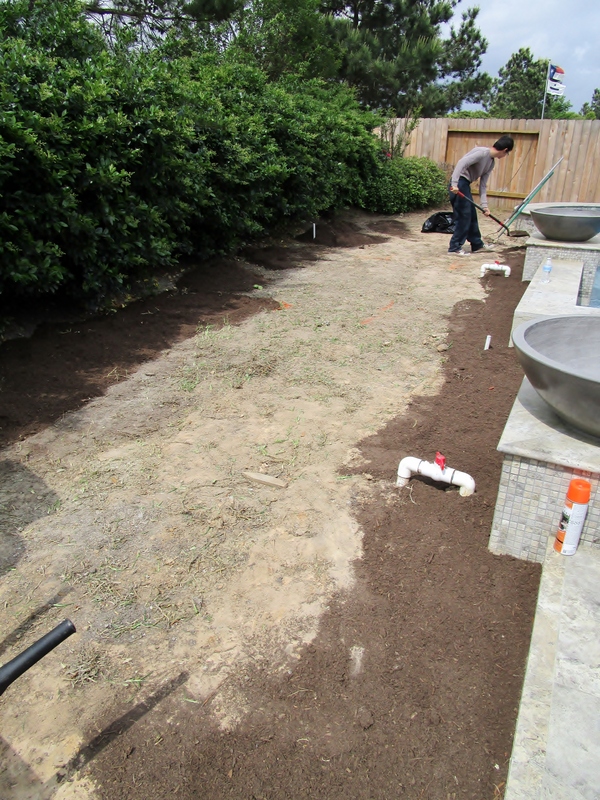 We started with a blank slate except the hedge of ligustrum. It helps block the noise from the street and middle school so needed to stay. 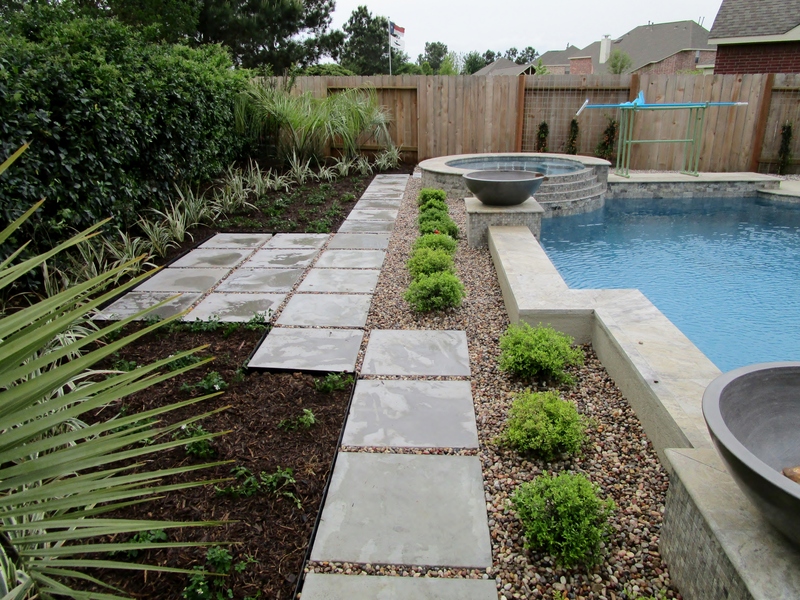 We worked to maximize the spaces around the pool by adding a patio in the angular side yard. 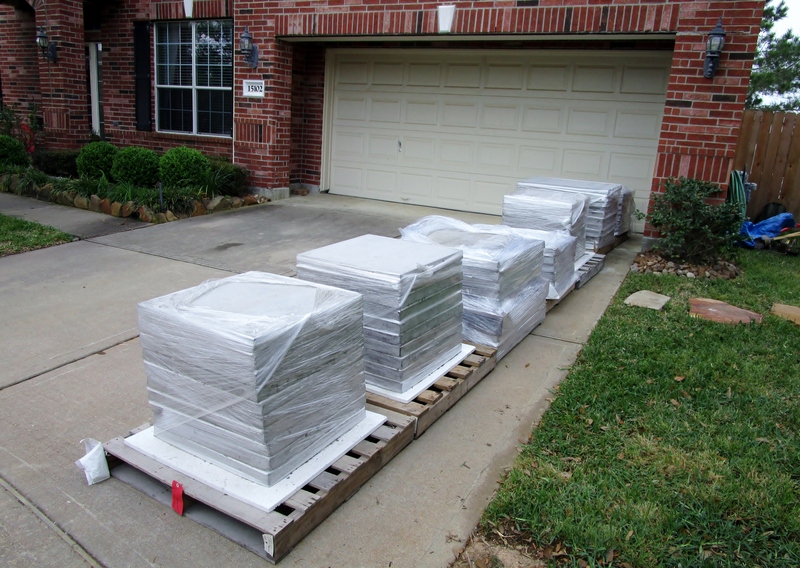 Amber wanted to use travertine tile to match the stone in the pool but it was not in the budget. 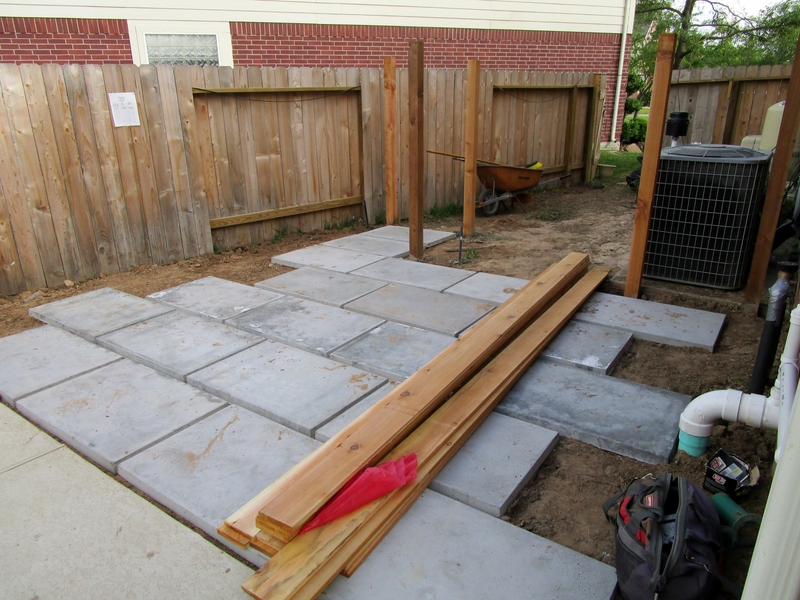 We suggested using the cement pad with rainbow gravel to make a nice looking and very functional solid patio. This was less expensive than many other options we discussed. In addition it is also water permeable. 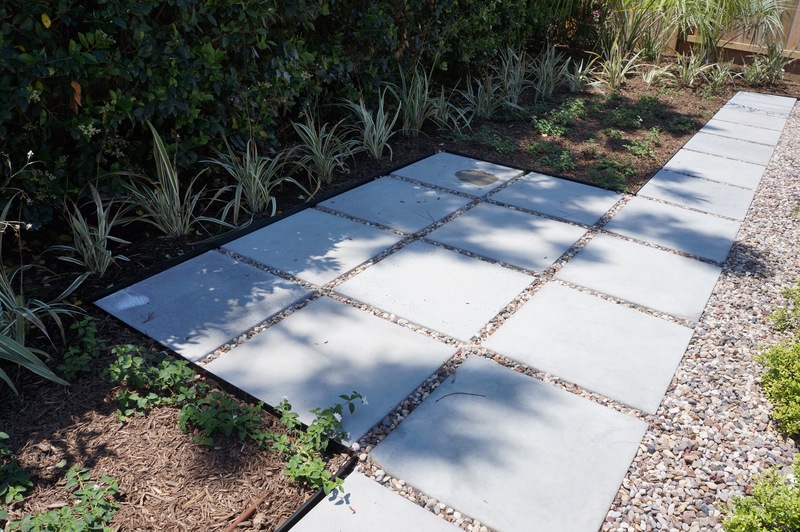 We used 1-36″x36″, 5-30″x30″, 24-25″x36″ and 30- 24″x36″ concrete pads so 60 in this install. That meant we really needed to have them delivered. They had recently moved the fence and gate back to have room for the pool equipment. We talked through how to create a screen to hide it using plants or wood. I thought another fence with a gate but they didn’t want to have to go through two gates. Then Shawn suggested an off-set screens to mask both the a/c and the pool equipment. From most angles the A/C and pool equipment is hidden yet easy to access. It also creates a place to store pool toys, etc. Here is Emma trying out the new path and checking up on the details. You see you have to be at just the right angle to see what is behind. 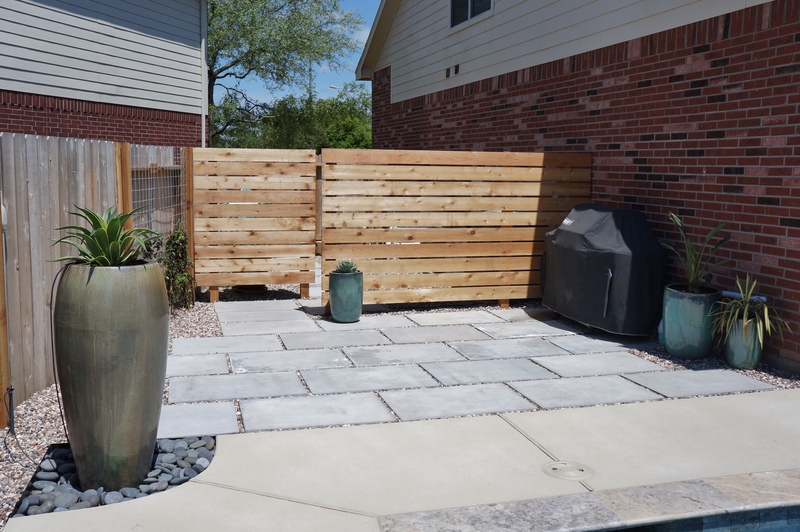 We created a path matching the patio behind the pool in the utility easement to add another way to get to the hot tub and even ended up with room for another little sitting area that gets more shade. The plants are all hardy and drought and frost tolerant. They also will need minimal trimming. We used drip tubing to water the beds because it is so much more efficient and waters the whole bed more evenly (they are even under the gravel at the dwarf yaupon hedge). View from the opposite direction after the mulch was installed. I am not a big fan of looking at mulch but to save money we used one gallon plants. I am hoping that the lantana will fill in quickly to eliminate the need to weed and even become their own ground cover. Here is the little patio that gets more shade than on the other side of the pool. It could hold a cafe table and two chairs or a bench. Perhaps it is a good place for a hammock. My daughter and her husband both grew up in Southern California. They enjoy modern clean lines. They were pleased with the modern Mediterranean beach look I came up with for them. 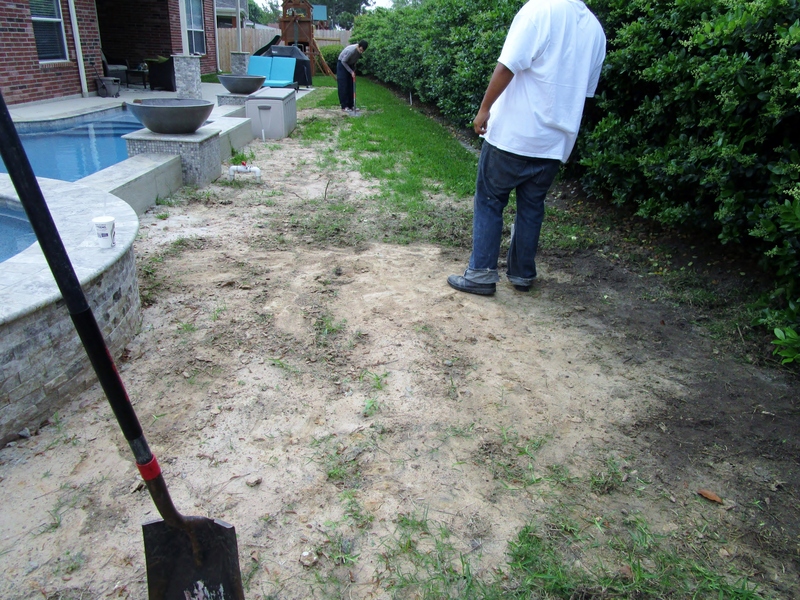 This area used to be lawn but after the pool was constructed it was just dirt/mud. Instead of putting back lawn, which they still have plenty of, I decided on big beds and fun plants. 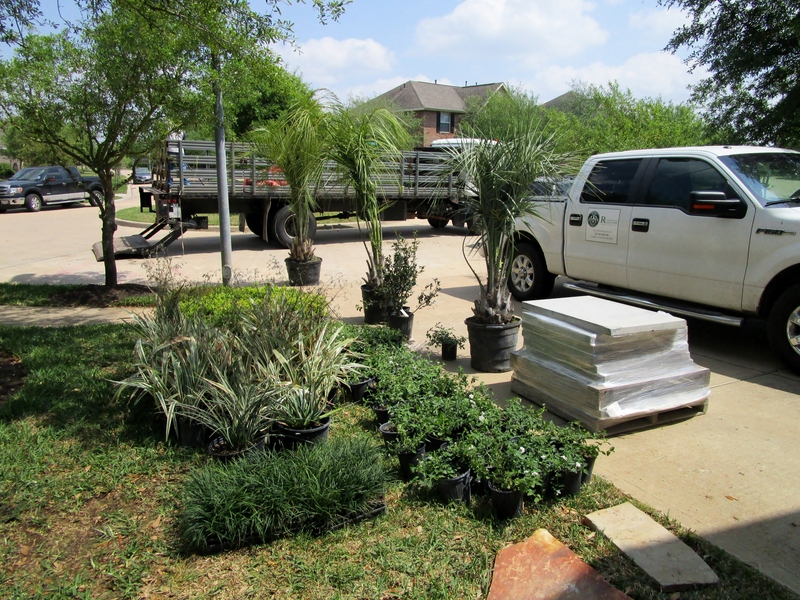 We used 3 Pindo palms, a field of white lantana, and a row of Dianella which will make a nice contrast with its variegated sword shaped leaves against the dark green ligustrum hedge along the back fence. I have read that lantana repels mosquitoes. That would be nice! The Pindo palms will only get about 12-15′ tall and are very hardy. I wanted something that stayed in your field of vision as they are really the featured plant. When my grandson Justin saw them he told his Mom that they are his favorite trees. Can’t say I planned that but it makes me smile. Amber wanted a small hedge behind the pool to hide the piping. We used Dwarf Yaupon holly. This gives a break of green between the pool and the path and already hides the plumbing, that otherwise would be quite obvious. 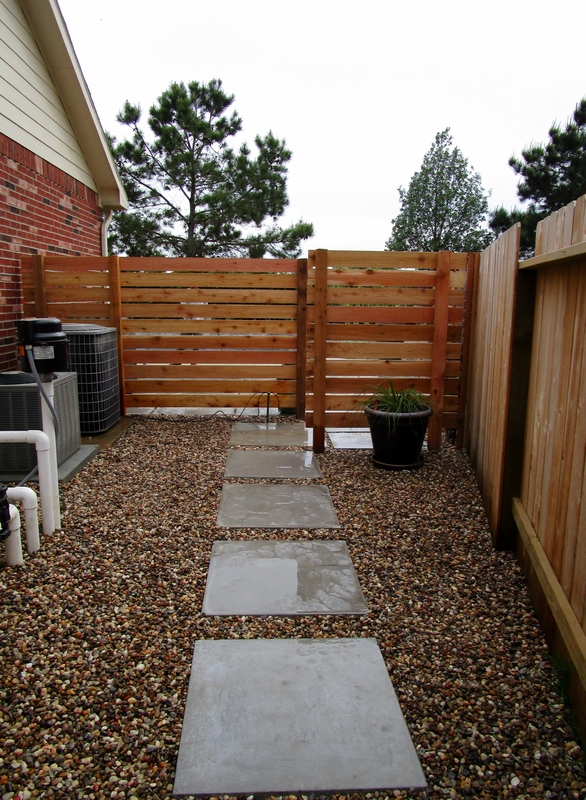 The path leads all the way to the hot tub which makes it accessible from both directions. 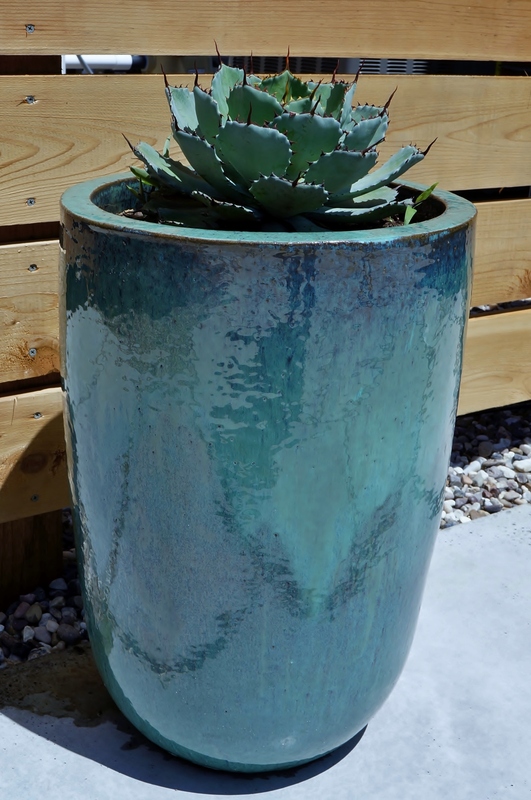 I had fun helping my daughter pick out pottery and plants for the new patio. We found it all locally at Joshua’s Native Plants. They import them straight from Vietnam. We placed these two pots here to help mask some of the plumbing. 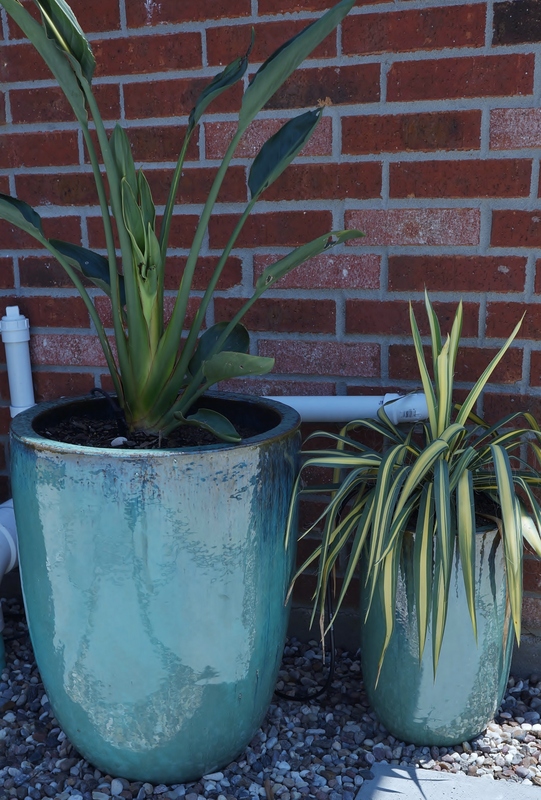 The tall one has a Bird of Paradises and the smaller a Color Guard yucca: one of my favorite plants. Both are heat loving and can take the afternoon sun. The 3rd pot in this set of 3 sports an Agave Kissho Kan. Agave sp. Kichiokan. According to Plant Delights, this is a Japanese selection that they believe came from a Mexican hybrid that was circulated by collectors under several spellings. Kissho Kan means “happy (lucky) crown”, in Japanese. For more info click HERE. I like the way the colors of the plant and pot go together. The largest pot is placed in a spot that is in the original design. I felt it must really have a presence while also staying in the color scheme of greens, turquoise and teal. Amber picked another agave which I think is a variegated Fox Tail agave. Do you see the little tube on the back? Each pot is on a zone dedicated to watering just the pots. 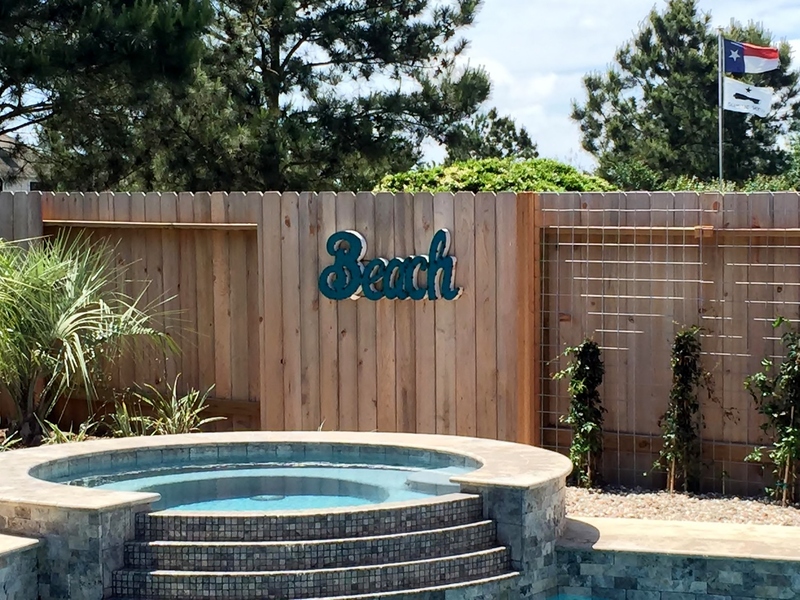 We put 3 panels of welded wire on the alternate sections of the good neighbor fence and planted Tangerine crossvine on them to add a green backdrop behind the pool. In between those panels we planted rows of Canna ‘Bengal Tiger’ (Bengal Tiger Variegated Canna Lily) that Amber sent me a picture of early on. 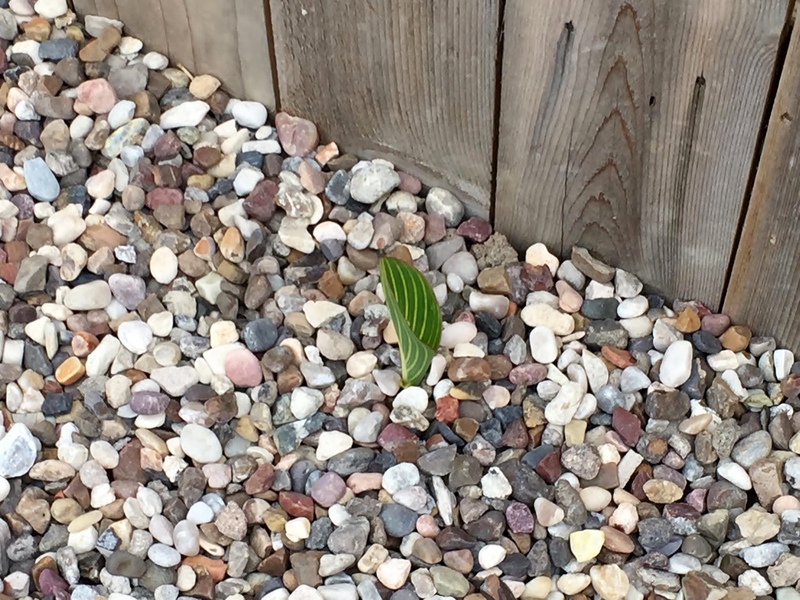 And here is the first little leaf pushing up. They should be fine here and are watered with drip tubing under the rainbow gravel. Even though they go away (rest) in the winter the rest of the time they will add to the SoCal feel. Here is a sign that Shawn and I found at Adkins Architectural Antiques and treasures and just had to buy : ) It is fun spoiling your children! My daughter and her husband did a great job working this pool into their back yard and I know the whole family will enjoy playing and relaxing in this inviting area for years. 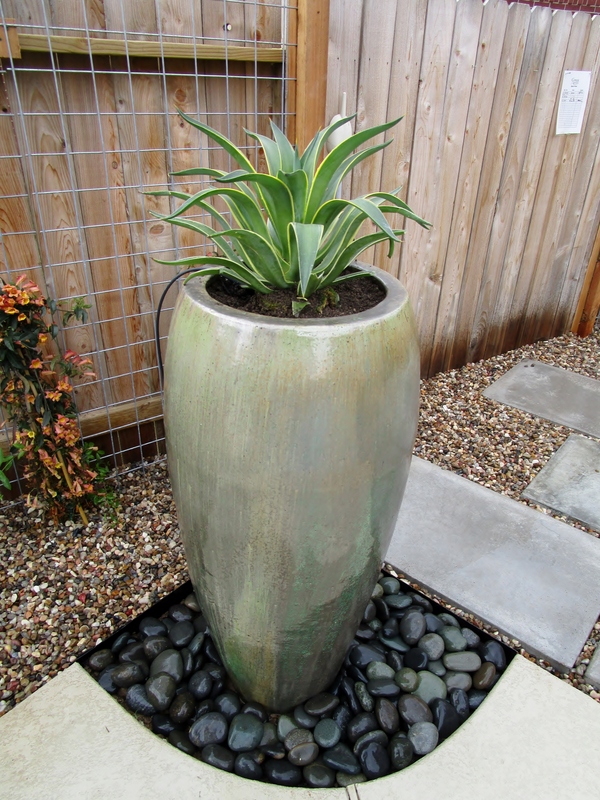 I am pleased with the plants and design and it did fit all the criteria. I will try and come back to amend this post when the plants are more filled out. Surfs up dude! Lauren, that is a beautiful pool, and your landscaping adds so much to the beauty of the space. Clever idea with the offset screens to hide the pool mechanicals, and I like the contemporary paving throughout the space. Nice job! Hopefully you’ll be invited over often to partake in the cooling fun! Thank you Pam! I am pretty sure as long as the self invite comes with watching the grans we are good! I almost include pictures of them enjoying the pool. How lovely! 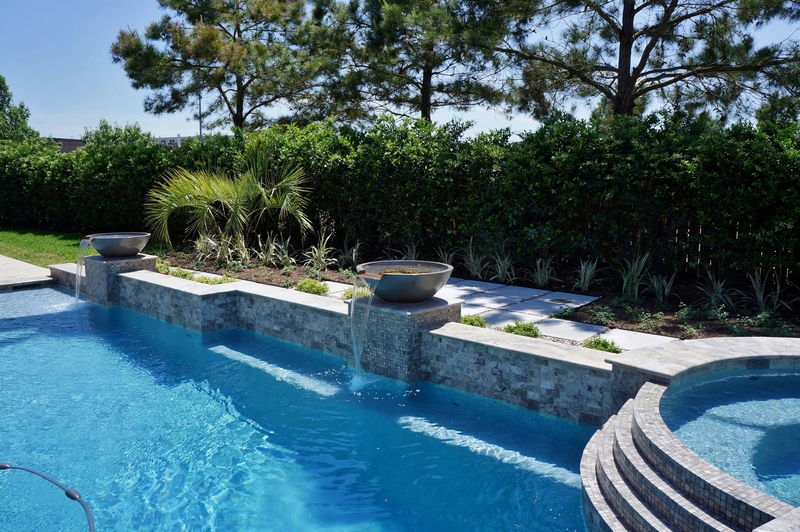 Both the pool and it’s surrounding plantings and hardscape are top notch. It looks like Emma approves too which is good, you don’t want an upset pug on your hands. Your daughter and family must be thrilled to have such a beautiful landscape to complement their pool. All ready for summer fun. I love the clean lines too snd rather wish Austin had had more of the modern look available years ago. Beautiful job. The pool is very classy and your landscaping to compliment it is wonderful. Thank you GWG. It was a labor of love! 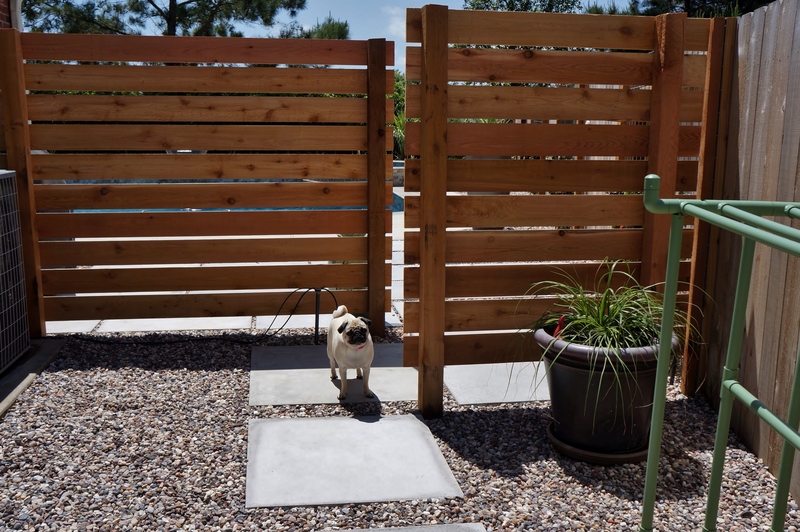 So much to like here: the clever offset solution, the pug, the pots (wow) but what I like most is your process and how you really have conversations with the people who will live in the landscape. I think the most important skill to have as a designer is to be a good listener. Being intuitive and creative is also helpful but giving people the garden they desire is key to making them happy! We do tell them, this is your garden, we are only visiting!